After the Brooklyn DIY space Death by Audio shut down, Mark Kleback took his indie “artcade” video games on the road. Now, he has the opportunity to give them a permanent home. Death by Audio Arcade’s indie video games have been at pop-ups like this one at Dreamhouse for five years, but are now on track to get a permanent home—you can support the cause, and get some games, here. “A lot of things about it were illegal,” Mark Kleback says, reminiscing about when he lived at Death by Audio, a party-battered Brooklyn warehouse space that hosted concerts, art exhibitions — and about a dozen illegal residents. “The protocol was that you didn’t answer the door unless you knew who it was, and you never let the police or the fire department in,” he says. In September 2014, the illegal arrangement started falling apart. Vice Media had received $6.5 million in tax credits to expand their headquarters in Brooklyn, and Death by Audio’s landlord started clearing out the space to convert it into offices. The irony of a company that celebrates youthful counterculture and underground scenes destroying the vibrant DIY space was lost on no one, but there wasn’t much that could be done about it. 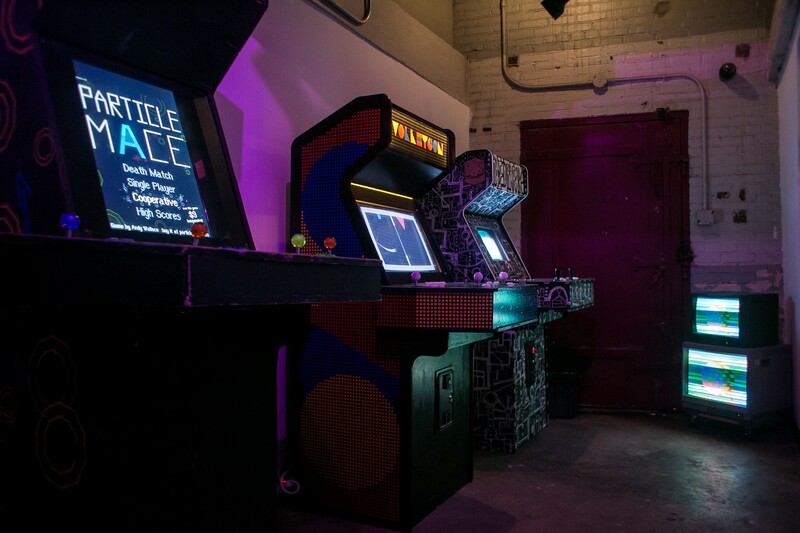 Kleback salvaged the indie arcade games he had housed there and took them on the road, hosting pop-ups at events like World Maker Faire New York and SXSW, and in Brooklyn venues like Elsewhere and Superchief Gallery. As a concept, Death by Audio Arcade is a strong node of the New York indie gaming community, but it hasn’t had a dedicated home in nearly five years. A new Kickstarter campaign aims to change that. Death by Audio was a place for experimentation — Kleback built a DIY arcade. Around 2010, Kleback reckons, he found a how-to blog post on building arcade cabinets and started making a few in the Death by Audio warehouse woodshop. He began with old ’80s video games like The Simpsons and X-Men, and put them out in the music venue. People coming in for concerts would maybe linger a little longer than they might have otherwise. Then, one day, Kunal Gupta and Syed Salahuddin, the founders of Babycastles, came by, and they struck up what would become a longstanding friendship. Babycastles is a nonprofit collective that amplifies diverse voices in video game culture and showcases new indie games; at the time, they were doing that in another Brooklyn DIY space called Silent Barn. And they wanted to create a collaborative exhibition building cabinets for new indie “art-cade” games at Death by Audio. “I had no idea this whole scene existed,” Kleback says. “They brought in games by Bennett Foddy, Ramiro Corbetta, and all these amazing indie developers for a gallery exhibition in the back of Death by Audio. NYU had just opened their Game Center, so I sent an email asking if anybody had games that would work well in the arcade, and I got a bunch of responses.” The developers, many of whom had never so much as touched a saw before, started building in the Death by Audio woodshop. With a place to hang out, digital gaming communities find physical form. The first game in the Death by Audio collection was Crystal Brawl, which they celebrated with a party that brought even more members of the indie gaming community together. One of those revellers was Andy Wallace, who made a game called Particle Mace that was so popular that a band playing at Death by Audio paid tribute to it in song. ‘Particle Mace’ is one of about 20 indie video games that are a part of Death by Audio Arcade. Sharing the space puts new players in the game. The atypical venue brought in different types of players. People coming for the art or music discovered how video games could be relevant to them, too. “It’s hard to get people to play games that they’ve never heard of. But when we would work with Death by Audio, the Silent Barn, and all these DIY places, the musicians were curious about it as art, and they played. I think people are more appreciative of the DIY games when they come to a place with a similar mission, versus an arcade with commercial games,” Kleback says. And though it’s been a hassle to take all the games on the road since Death by Audio closed in 2014, it’s been an opportunity to evangelize video games as important cultural media. 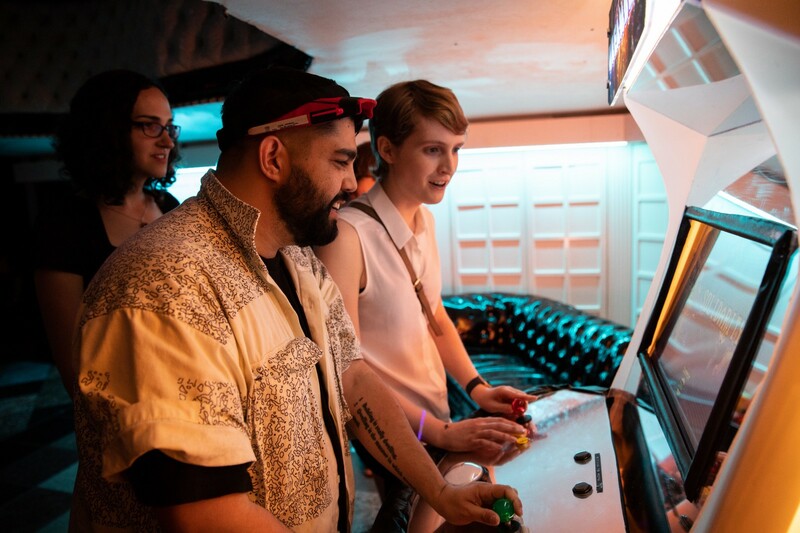 The Smithsonian American Art Museum invited them to participate in an exhibition called SAAM Arcade, an annual celebration that’s sponsored by American University. 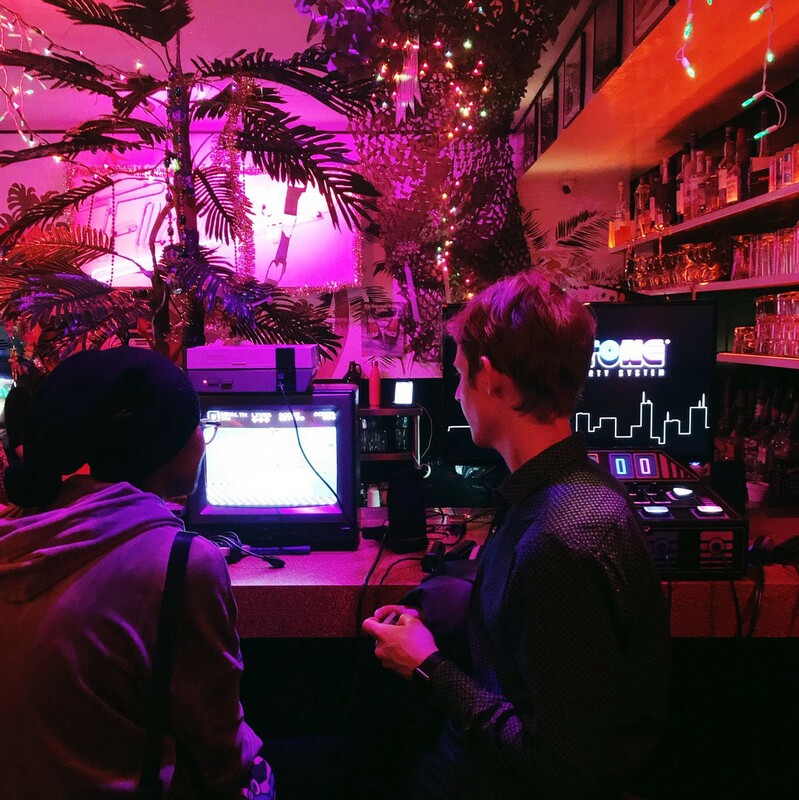 They’ve done a pop-up at SXSW and residencies at local bars and venues that aren’t necessarily thought of as video game hotspots: Elsewhere, Superchief Gallery, Brooklyn Research, Secret Project Robot, and many more. “I feel like it’s been legitimized in a lot of ways,” Kleback says. After years on the road, the mobile arcade settles down. It was gratifying to build wider recognition and community around the art of video games, but it was frustrating to do it with no dedicated space. Then Secret Project Robot, a Brooklyn art gallery and music venue, floated the idea of handing over their longtime lease. Kleback and Gross started planning how they might make their friends’ venue their own. 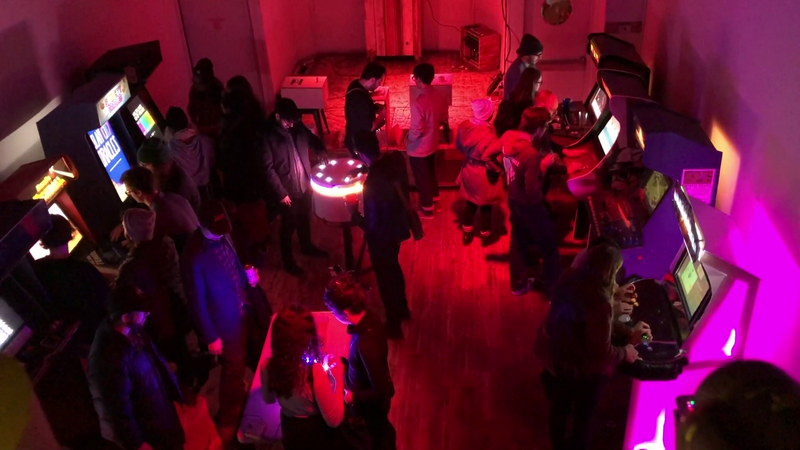 Death by Audio Arcade has already hosted pop-ups at Secret Project Robot. Now they have a chance to make it their official headquarters. Wonderville, which they’ve launched a Kickstarter campaign to help finance, will house the 20 indie games Death by Audio Arcade currently carts around the country, but they also plan to host special exhibitions, tabletop game nights, and other programming to welcome people who, like Gross, might not consider themselves “gamers” into the new DIY space. The team learns to play the system and collaborate with the city. Death by Audio, Silent Barn, Babycastles, and so many other DIY venues in New York have learned — the hard way — how much it takes to run a sustainable, legal gathering place. Kleback and Gross are preparing to open Wonderville with the benefit of learning from all those painful experiences. Gross might not consider herself a “gamer,” but she is an expert navigator of New York City’s maze of bureaucracy and licenses. To prep for reopening Secret Project Robot as Wonderville, she’s been attending meetings with the New York City Artist Coalition, the Office of Nightlife, and the local precinct, and feels confident that the community will welcome them precisely because they’re taking all of these precautionary steps. “I think a lot of places are like, ‘Oh no, a government agency is coming.’ We’re trying to foster a community where we do it right. We know the safety risks, coming from the DIY world, so I really want to support a safe and fully legal thing. And the wonderful situation that we’re in is that Rachel [Nelson] and Eric [Zajaceskowski] at Secret Project Robot have an amazing space, liquor licenses, and community board support already,” Gross says. Wonderville Arcade is live on Kickstarter until April 3, 2019.